INSTRUCTIONS FOR PURCHASING TICKETS LOCATED AT THE TOP OF THE DONATE PAGE. If you are interested in becoming a sponsor, please email info@ysef.org. On April 21, 2018, YS parents, alumni, teachers, administrators and supporters gathered at Heritage Hills to celebrate the innovative, creative and excellent learning opportunities that were funded by YSEF for the 2017-2018 school year. 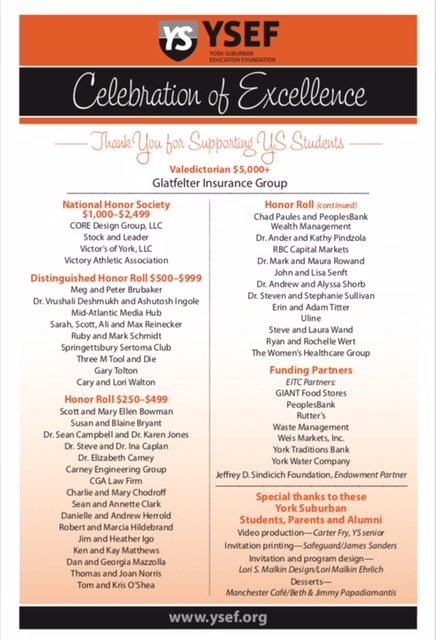 Through sponsorships, ticket sales, the silent auction and general contributions, the YS community raised over $33,000! The money raised will support innovative programs that enhance the educational experience and foster continued academic excellence for district students. A highlight of the evening was the premiere of an outstanding video produced by YS senior Carter Fry that features YSEF grants in action, the work of the student-led Impact Foundation, and testimonials from students and teachers. Please take a few minutes to watch the video below to hear from teachers and students how your support of YSEF makes an impact on their education!